Helping those who dedicate their lives to helping us. No matter what the situation, the loss of a parent is a life-altering event made even more difficult around the holidays. When your parent is an Officer lost in the line of duty, you know that they sacrificed their life to keep others safe but that doesn’t make the loss any easier. 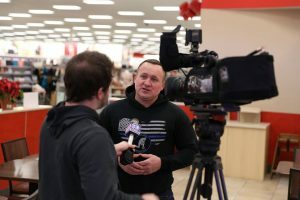 This holiday season, I had the opportunity to give back to some of these children of fallen Police Officers, through the Badge of Honor Association’s ‘Children of the Fallen’ shopping event. 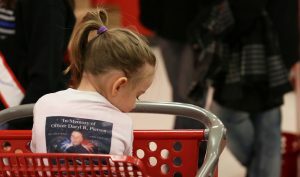 Badge of Honor’s ‘Children of the Fallen’ shopping event is an annual holiday event hosted by the chapter members. Last year, the children of fallen Police Officers from Western and Central NY were invited to participate in the program. This year, each child was also treated to lunch with the BOHA team and were able to shop at Target with a Police Officer. 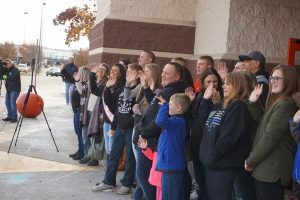 Myself and several other members of the L-Tron team came out on Sunday morning, December 10th to show our support and donate a cart of toys. We arrived at the Henrietta, NY Target and were welcomed into the BOHA family. We loved meeting the kids and all of the active duty Police Officers who were willing to spend a part of their weekend giving back to the families of their brothers and sisters in blue. 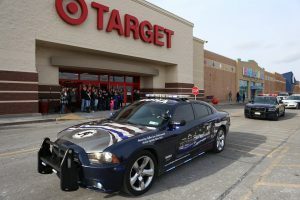 It was amazing to watch the large assortment of patrol cars and police vehicles roll into Target, lights and sirens blaring, to show their support for the children. The children participating came in all ages and sizes. While us L-Tron volunteers were paired with two teenage boys, some children were as young as 3 or 4 years old. The most heartwarming thing for me was to watch some of the children using their shopping “money” to purchase gifts for their mothers or other loved ones. Just like the parents they lost, these kids were raised to put others ahead of themselves. 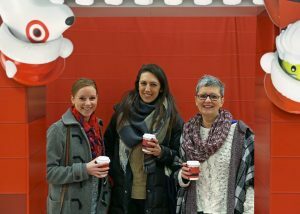 We spread out across Target, enjoyed hot chocolate and Christmas cookies, and shopped for a few hours. All the families were so appreciative of the encouragement from the community. Several other local businesses also donated carts of toys. L-Tron team member, Hank, took several photographs of the event. Hank (a retired Police Sergeant himself) also got several 360 degree shots with OSCR360. After taking some group pictures, all of the ‘Children of the Fallen’ attendees headed over to lunch at Uno’s. It was easy to see how appreciative the families were, not only of the lunch and their shopping sprees, but also of the support they were able to provide for each other. Every family there had lost someone – and now had a small network of Police Officers and community members to lean on and commiserate with for the afternoon. The Badge of Honor Association (BOHA) is a 501c3 nonprofit organization that was founded in 2007 by Rochester Police Department (RPD) Sergeant Justin Collins. 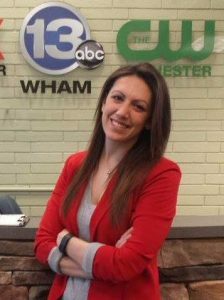 The association is based out of Rochester, NY and operates on a 100% volunteer basis, primarily driven by active Law Enforcement Officers and civilians from agencies throughout Western and Central NY state. In just 10 years, the organization has grown from covering one county to covering 27 counties across the state today. The BOHA’s primary mission is to support the children of Law Enforcement Officers that have made the ultimate sacrifice in the line of duty. They also help Officers dealing with the after effects of being involved in a critical incident. BOHA supports the children of fallen Police Officers by sponsoring a weekend retreat at Darien Lake, the annual ‘Children of the Fallen’ shopping event, and funding the cost of college books and boarding. In addition to these programs, BOHA will also help the individual needs of the children of fallen Police Officers. Chapter members maintain strong relationships with the families in their county, and can bring specific needs to the leadership team so support can be provided. BOHA also provides awareness, peer counseling, and education, as well as recognition to Officers who have been involved in critical incidents. They can provide both financial support and emotional support for the affected Officers and their families. How can you help the families of fallen Police Officers? 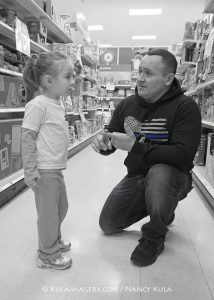 Although the next ‘Children of the Fallen’ shopping event is almost a year away, there are other ways that you can give back to BOHA and the families of fallen Police Officers. The Badge of Honor Association is always accepting volunteer applications. For more information on the program and to see their list of upcoming events visit www.facebook.com/BOHA. Are you a local business owner? Consider hosting your own event and donating the proceeds to BOHA. Remember, if you ever have an emergency, a Police Officer is the first person you are going to call – why not give back to them?